I've been doing some research lately on Ahikar, a major extrabiblical character who shows up in the book of Tobit in a minor role. Doing this reminded me of another minor character in the book of Tobit: Tobit's dog. Tobit's dog appears only twice (in 6:2 and 11:4) and plays no role in the story (actually he accompanies Tobias, Tobit's son). Like many dogs, he just shows up whenever something seems to be going on. This little detail has greatly exercised the commentators, and even now no one seems to know how the dog got into the story. With this view he approached us, with many bows and grimaces, and, after having welcomed Miss Snapper to the place, asked her in the hearing of all present, if she could inform him of the name of Tobit's dog. Miss was so much incensed at his insolence, that I should certainly have kicked him where he stood without ceremony, had not the young lady prevented the effects of my indignation, by replying with the utmost vivacity, "His name was Nash, and an impudent dog he was." I will show them, with outstretched neck and twisted mouth, that you hold an erroneous opinion in relation to the cells in which the Septuagint was studied; that you have even spoken disrespectfully ten years ago of Tobit's dog, which you asserted to have been a spaniel, while I proved that it was a greyhound. THAT Expression in Apocrypha about Tobit, and his Dog following him, I have often heard ridiculed; yet Homer has the same Words of Telemachus more than once; and Virgil says something like it of Evander. And I take the Book of Tobit to be partly poetical. 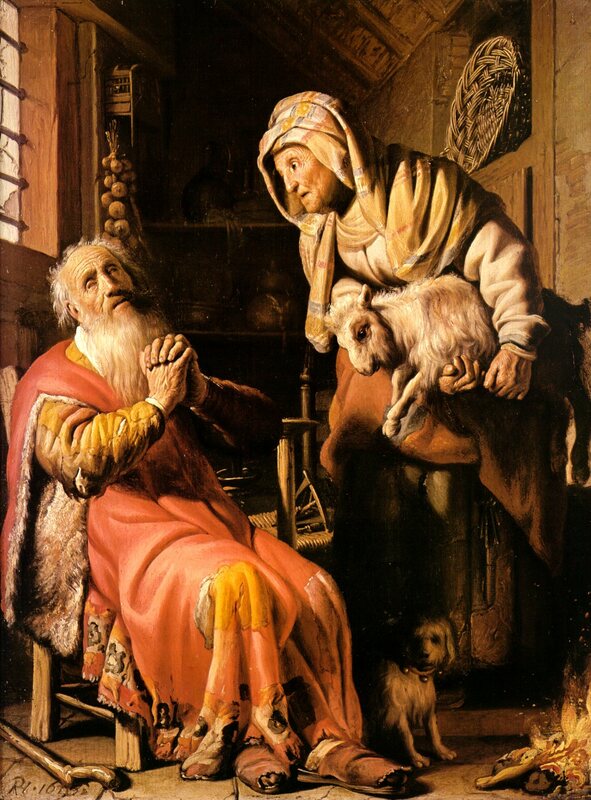 Look at Tobit, and his dog; it is absurd! Bel and the dragon may be true, but it has nothing to do with inspiration. 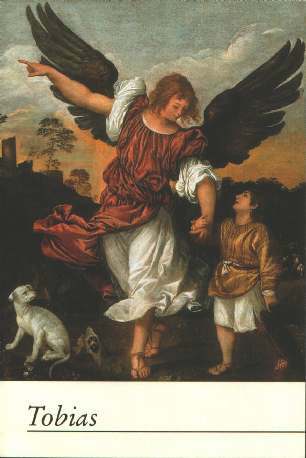 The dog is also a normal part of the iconography of Tobit. These links give the idea: A B C D E F.
There is an old theory that the dog really belongs in the Odyssey, because the book of Tobit, besides emulating the book of Job (Deborah Dimant wrote about that, I think in the book Mikra co-edited by the late M.J. Mulder and my Kampen colleague Harry Sysling), supposedly emulates also the episode of the journey of Telemachus in the Odyssey. Cfr. Carl Fries, ‘Das Buch Tobit und die Telemachie’, Zeitschrift für Wissenschaftliche Theologie 53 (1911) 54-87; Dennis R. MacDonald, ‘Tobit and the Odyssey’, in: Dennis R. MacDonald (ed. ), Mimesis and Intertextuality in Antiquity and Christianity (Harrisburg, PA: Trinity Press International, 2001) 11-40; George W.E. Nickelsburg, ‘Tobit, Genesis, and the Odyssey: A Complex Web of Intertextuality’, in the same volume, 41-55. Perhaps one should not take it for granted that the dog was Tobias' dog. In the codex Vaticanus 5:17 it is the dog of the lad, i.e. Tobias, but in the Codex Sinaiticus the dog appears first in 6:2, and it is not clear whose dog it is. Note that the Sinaiticus has the longer version which is presently regarded as the more original. A minority of (mainly older) scholars who have posited a Persian background for the story have referred to the holy character of dogs in Zoroastrianism, being opposed to evil demons, and have compared Raphael to Sraosha. This idea has been taken up again in the novel Miss Garnet's Angel by Sally Vickers. Telling is the Jewish position on dogs, namely as unclean animals. The scholars I've read suggest the dog is a remnant from a secular version of the Tobit story, possibly of Persian or Sumerian origin. The Anchor Bible mentions a saying from the Ahiqar tale, "My son, sweeten your tongue and make savory the opening of your mouth; for the tail of a dog gives him bread, and his mouth gets him blows." Dogs also assisted people in subduing demons in certain pagan traditions, but the dog doesn't appear to be closely associated with Raphael. Jewish assimilation in non-Palestinians cultures might have rendered them more open to the acceptance of a dog than Jews in their homeland. Finally, a friend has inquired if I plan to add the dog to the stage production of my musical based on Tobit. My wife's dog has a mild enough personality, but would be frightened considerably at the prospect of assisting against demons and strange fish. I read Michael Nicholas Richard’s book Tobit’s Dog in a single sitting. And then I picked up the Bible, and read the Book of Tobit. 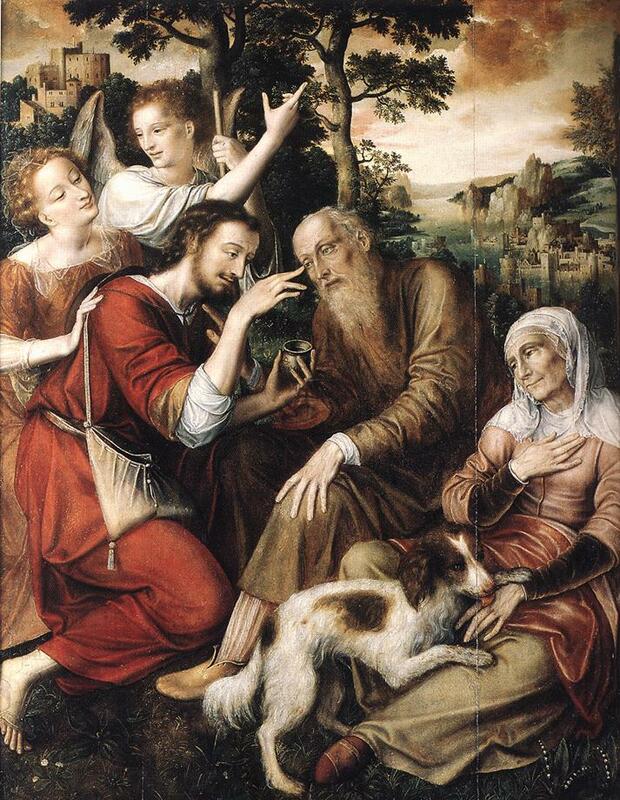 The dog is only mentioned twice in the Bible, but he becomes a key character in Richard’s book. I guess that’s why it’s called fiction --- and maybe why I liked it so much.